I seem to have a special talent for going to the post office or newsagency right on Peak Minute, and end up standing in a queue next to carousels full of cheap cards, stickers and books with titles like “Teach Your Child To Read” and “Amazing ABCs”. I am irresistibly drawn to these books and start leafing through them, though I know from experience this will only make me grumpy. These books are almost invariably written by people who don’t seem to have much linguistics knowledge or to have studied the best way to help children learn to read. Many are at least as likely to confuse children and waste their time as help them learn to read and spell. Here we have a mixture of short and long words, easy and hard spellings, and no obvious beginning reading/spelling skill being taught at all. The only way absolute beginners will be able to do this activity is if they can get an adult to explain how to do it, and read out all the words for them. 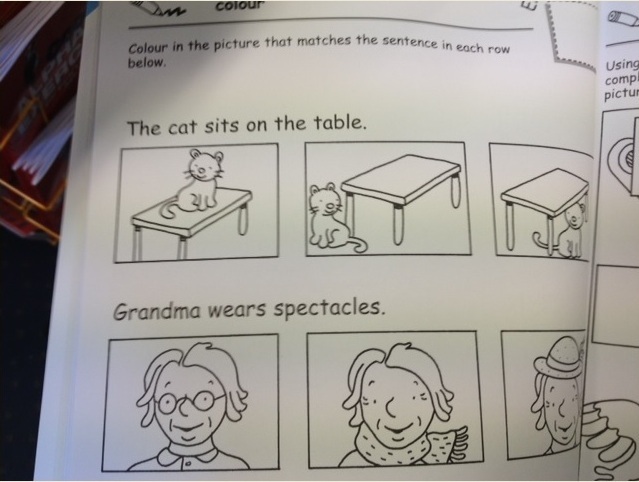 “Red” is really the only word on this page that belongs in a reading/spelling activity for absolute beginners, because it’s a short word with one letter representing each sound. 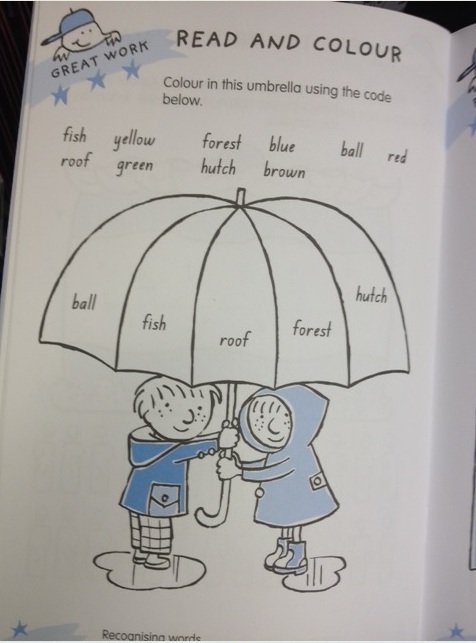 The activity itself is laid out in a confusing way, because the word “fish” is closest to the word “roof”, not the word “yellow”, which it seems to be intended to match. These words don’t seem to even be related by meaning, the reason many “spelling lists” consist of words with disparate spellings. I don’t understand why the forest is blue, and the fish yellow. I’m not sure the author of this page knows the difference between the definite and indefinite articles in English. 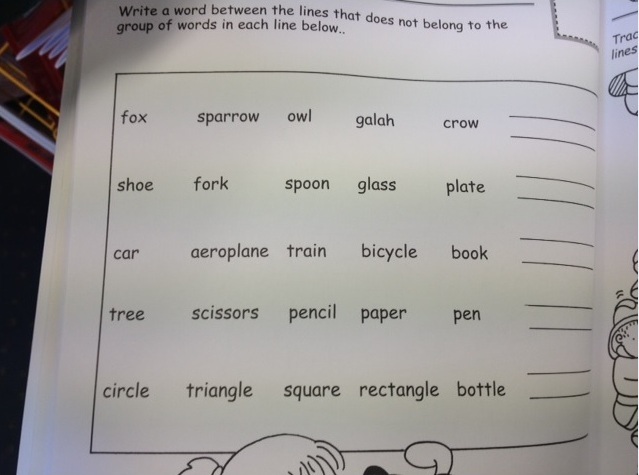 Again there is a mishmash of long and short words and easy and hard spellings, including some really hard ones like the “ah” in “galah”, “oe” as in “shoe”, “aer” as in “aeroplane” and “ss” as in “scissors”. It’s also unclear why learners are asked to copy the odd one out instead of just circling it. Maybe handwriting practice? But if you don’t know what you’re writing, you might as well copy chicken scratchings. The usage of the letter X in the word “X-Ray” is highly irregular in English, so why anyone uses it as an example in books for absolute beginners is a complete mystery to me. 1. Representing the sound combination “ks” at syllable endings, as in fox, six and wax. 2. Representing the sound “z” at word beginnings, as in Xavier, xylophone and Xena the Warrior Princess. Only the first of these two usages really belongs in a book for absolute beginners, except perhaps beginners called Xavier, Xander or Xerxes. 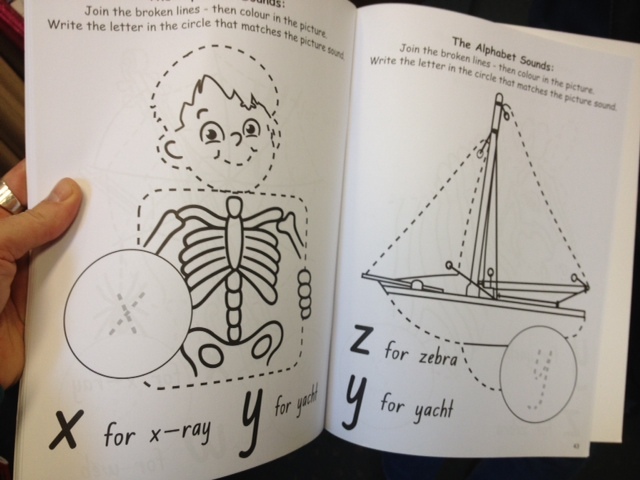 On the page about the letter Y, the example word given is “yacht” – even though the rest of this word’s spellings are likely to add more confusion than clarity in little learners’ minds about how letters and sounds are related. If you want a quick litmus test of whether a book about learning the alphabet is any good, I recommend turning to the pages about X and Y. If you find any X-rays or yachts, move on. What can I say? More mixtures of long and short, hard and easy words. To absolute beginners these are likely to look like chicken scratchings, and how sounds and letters work doesn’t get a guernsey here. I would never use this activity with a beginning learner I was trying to teach an understanding of how sounds and letters work. 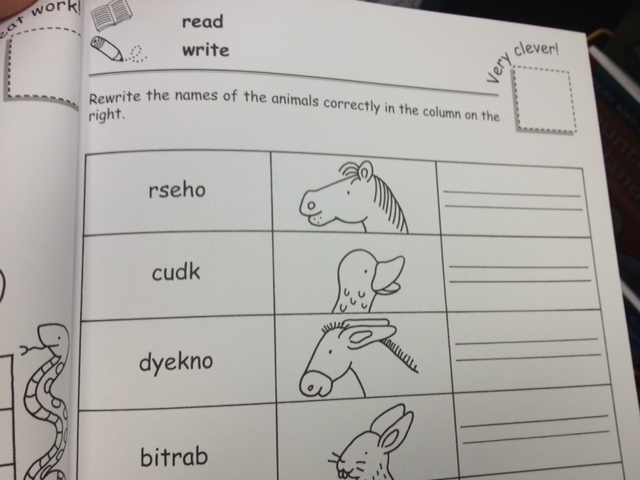 Let’s think about the sounds in the word “horse”. There are three of them, represented by the spellings “h”, “or” and “se”. Instead of keeping these spellings together to help learners understand how sounds and letters work, this activity scrambles them. It does this for all these words – there are three sounds in duck, and five in donkey and rabbit, but the two-letter spellings or digraphs in each of them – ck, ey and bb – are split up. This is not likely to help a child crack sound-letter relationships. Anyway the moral of this blog post is: I do not recommend buying literacy-teaching materials from post offices, newsagents, $2 shops, remaindered bookshops or other places where there are no early literacy experts, unless you are very confident that you can find good materials in among very many not-so-good materials. Spend your hard-earned cash on materials that are based on the scientific evidence about how to best teach children to read and spell. There are many, many such resources available – see my Phonics Resources list for examples, and please let me know if there is something good available that’s not on these lists. 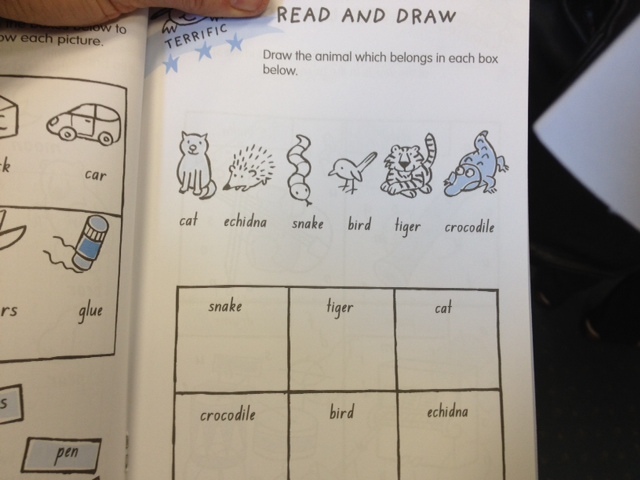 This entry was posted in books, phonics activities, reviews on April 28, 2013 by alison. I was going through one of these books with my 5 year old yesterday…I bought it because it was cheap, something that would fill in time, and help her reading, writing, and comprehension. Ha. I couldn't work half of it out. There wasn't anything she could do by herself, except colouring and as I said, some of the pages I struggled to understand. I will be more discerning next time I buy an 'educational' book for her! Thanks. I wonder if you have looked at ABC Reading Eggs. The online program seems pricey as you pay a yearly subscription fee. I saw their books in an Australia Post shop and wondered what you would think of them. Hi Bronwyn, from what I’ve seen of it, Reading Eggs is not a synthetic phonics program, it’s more of a mix-of-methods approach with some analytic phonics, some initial phonics, and some Whole Language. So it’s similar to what lots of schools do – introduce a sound for each letter, a list of high-frequency words, and then bathe children in written language until they either crack the spelling code or fail to do so. I can’t see anything in it that suggests it systematically unpacks the spelling system for children, starting with a small number of sounds/letters, and reading and spelling words made with them, then rapidly mixing additional sounds/spellings just one or two at a time, till the basic code, and then the advanced code, is covered and practised to automaticity. The Reading Eggs approach is much more random, as far as I can tell (but I am just going off what I can see on their website and what I’ve seen of their materials in the ACER bookshop). For example there is an activity at http://readingeggs.com.au/lessons/66/preview which first asks you to click on the “b”, but at first it’s the only new thing on the screen, so the skill taught is clicking, not recognising the letter, and then it has an activity where you have to click on the “b” from a choice of 3, but the feedback when you get it wrong is more interesting than when you get it right. 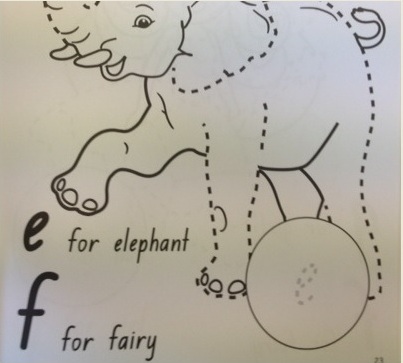 I can imagine kids getting it wrong on purpose. Then it moves straight into “b” in words but doesn’t tell you what the words are, and some of them are very long e.g. 5 sounds, and two-syllable words. I would prefer to have an activity that gets you to discriminate individual sounds/letters from a greater array, then learn a few more letters, then put them together to read for meaning – more like what Phonics Hero does. The activities seem to have no hints, they just keep repeating the same question over and over till you answer it correctly. If you keep making mistakes, the task is not simplified. Both letter names and sounds are introduced, which I think is confusing – what matters at the start is the sounds. The pronunciation of the sounds is not crisp, e.g. the sound “t” should be a voiceless sound but it’s pronounced with voice as “tuh”, which can lead to some children confusing it with “d” and having trouble blending it. Some of the task instructions are confusing e.g. there is a “fly to the tree with your letter” activity, but it doesn’t tell you it has to be the nearest tree with that letter. So I was clicking on trees with “b” and getting nowhere. The task should be demonstrated first for little kids, as they’re even more prone to misunderstand things like this than adults. Reading Eggs then makes a huge jump straight into reading words containing vowel digraphs and other complexity e.g. it introduces the letter “b” then jumps straight into an activity requiring you to read words like “bone”, “book”, “ball” and even the two-syllable “baby”. This activity does ignore errors, which is good, but how learners are meant to know how to read these words except by making lucky guesses and then remembering what worked is unclear to me. A little further on, there is a “read a book” activity which says “this is the letter B, it makes the sound bee, ball, book, balloon, baby, bell…” etc, which is frankly inaccurate and gives children the false impression that the only important sound/letter in a word is the first one. So I guess Reading Eggs is probably going to help the sort of child who is destined to learn to read no matter what their parents/teachers do, but unless you know that your child is one of those (and who does? ), I’d be looking for a synthetic phonics program instead. thank you! A very clear analysis of the problems with Reading Eggs. I see it recommended by parents who respond to my words of caution with "well it helped my child"
Yes, Reading Eggs is a bit like Reading Recovery, you’d do it if you didn’t know there were more effective alternatives. Thanks for your thoughts on Reading Eggs Alison. I've had success with Reading Eggs in our household, but as you say it could be because my daughters would have learned to read with other methods also. I would add that it's not the sort of program that kids could sit and do on their own – a parent really needs to be there for all of the activities, either to help with the mouse or add further explanation. And it goes without saying that it's not a replacement for lots and lots of reading aloud.